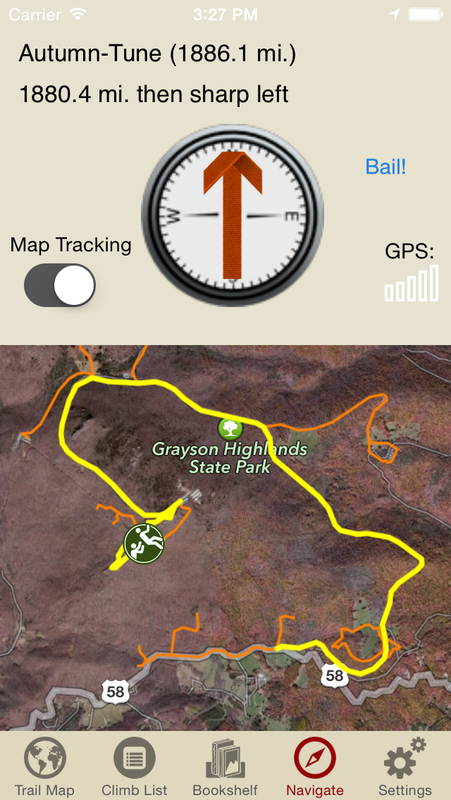 I’m excited to announce the new Rakkup mobile guidebook app for Grayson Highlands Bouldering. 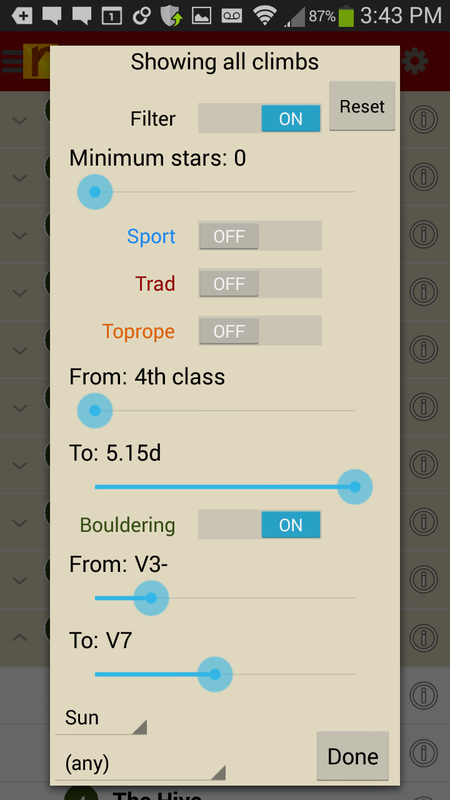 The Rakkup app includes full guidebook content to every area, boulder, and problem in GHSP along with powerful search and filter options to customize your climbing experience such as “all V5s in shade” or “V4-V6 in sun.” One of the most powerful utilities the app features is turn-by-turn trail navigation. 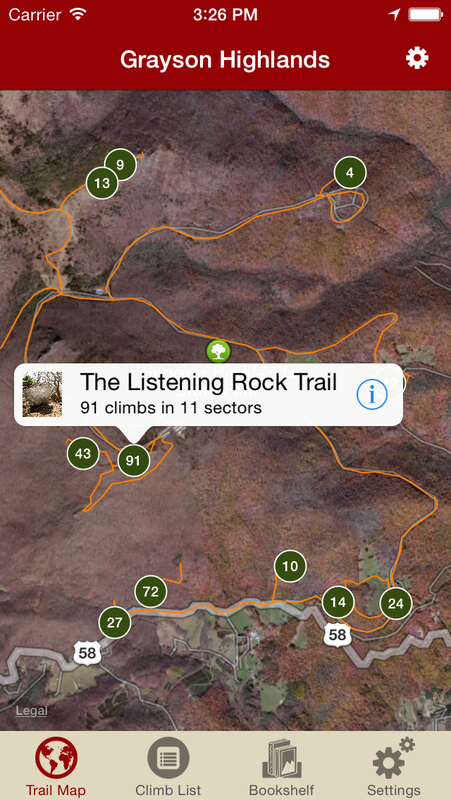 Rakkup uses detailed trail mapping and GPS information to get you to any climbing destination in the park, so no getting lost trying to find boulder problems or boulderfields like Moonlight Sonata or the Crooked Road Boulder! After all of the GPS and trail data was collected I drove out to the park to field test the app. I had high hopes for the app or course, but this has far exceeded my expectations. Once I got to the park entrance I tapped on the Thews Boulder in the Middle Boneyard Area and hit “go.” The large compass arrow and GHSP map popped up with the road and trail highlighted. Driving toward the parking area, a black dot illustrated where I was as I approached the trail head. Hiking up, the distance count became smaller and with every approaching turn the directional arrow guided the way. Once I reached the boulder, the topo illustration filled the screen showing where every problem on the boulder is located. Tap the small arrow on the screen and there is a high quality photo and problem overlay. SO NICE! Visit Rakkup’s website, download the app, and purchase the GHSP Bouldering Guide with either a two month rental fee of $7.99, or buy it for three years for $15.99 (just a heads up on the three year situation, Rakkup is changing the format from three years to “forever” sometime this fall, and buying now will end up being a really great deal, so don’t wait!). There is also an option to purchase the print guidebook and app combo for a great price!